Her singing talent is unquestionable, but an impressive list of guest artists is the precise reason why Sara Lugo & Friends confirms her integration into global reggae culture. Hailing from Germany, Lugo’s album features some Jamaican-born artists, like Skarra Mucci and Cali P, who have primarily found their success in Europe. Her crew of associates also includes some talent whose names are as recognizable in Jamaica as they are in the rest of the reggae world. 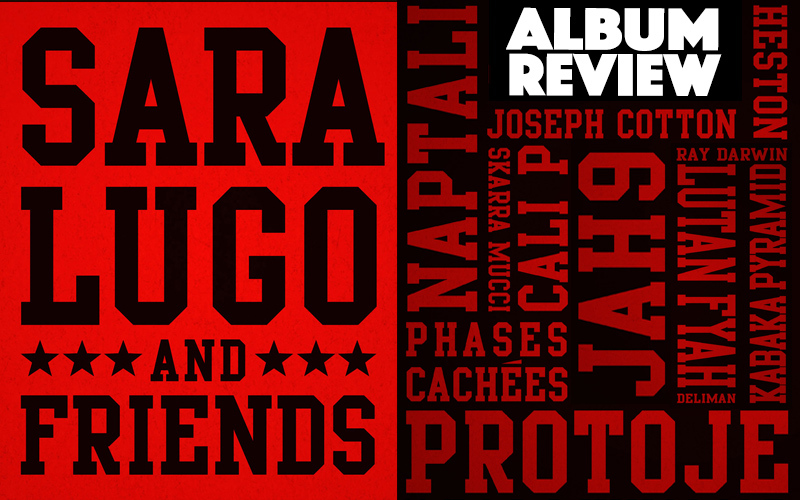 Protoje, Kabaka Pyramid, Lutan Fyah, and Jah9 all lend their skills to this album, which as the title implies, is composed solely of Sara Lugo’s collaborations with other artists. The listener can also expect good things from less familiar contributors like Naptali from Jamaica, Indonesia’s Ras Muhamad, and even some multi-lingual combinations featuring French reggae/hip hop artist Phases Cachées and Spanish singer Zuri Candela. Taken as a whole, the performers on Sara Lugo & Friends are a good representation of how reggae culture has spread from Jamaica and throughout the world. Listeners will detect a wide spectrum of styles from reggae’s musical bloodline on the album, including rocksteady, rub-a-dub, lovers’ rock, and dancehall, as well as tracks like Pour Le Plaisir and Forward, which infuse hip hop with reggae. The variety of vibes is partly due to the assortment of record labels and producers associated with the production of Sara Lugo & Friends. Oneness Records, the label that helped build Lugo from a backup singer to a headliner, is the primary riddim contributor and the label behind her last two albums. Almost all of the Oneness-produced tracks originally showed up on other releases that either took the form of a riddim juggling or a track included on a previous album from Lugo’s “guest” artist. Learn To Grow with Ras Muhamad was on his record from 2014, Salam, and And They Cry with Naptali was on his 2010 full length release, Long Journey. Selectors and reggae aficionados will recognize versions from jugglings like Ram Jam from Silly Walks Discotheque, Impossible from Bizzarri Records, and several from Oneness including Yemisi, Rise Up, and Reggaeville. Although listeners may have already heard many of the songs from Sara Lugo & Friends on previous releases, gathering all of these duets on one record serves Lugo nicely since she performs outstandingly well in combination. She is able to blend beautifully with artists who have a wide variety of voices, and the chemistry is almost always natural and energetic. This skill may be most obvious on Rejoice with Jah9, who wields her operatic, husky baritone in her unorthodox style, which at first seems ill-suited to Lugo’s more pop-soul approach but proves to be an organic coupling and perhaps the best track on the album. While the deeper roots reggae sound is present in Rejoice as well as They Know Not Love featuring Lutan Fyah and High & Windy with Kabaka Pyramid, Lugo’s fun and upbeat side is also represented on the album. Tracks like the Phyllis Dillon update, Don’t Stay Away, Really Like You with Protoje, Forward, and the only dancehall tune on the album, Wine Now, remind listeners that Lugo has the kind of voice that translates across genres such that she could very well make an impact on pop markets if she were to choose to take that path.